HAWKEN has been able to create a balance of twitch gameplay while still feeling like you are piloting a huge bipedal machine. The fast, frantic pace of the action feels realistic, and it’s unbelievable that this is coming from something that is free-to-play. Now Cryptozoic Entertainment is going to try to match that with the upcoming HAWKEN: Real-Time Card Game. In HAWKEN: The Real-Time Card Game, players grab a Mech deck that contains cards for primary and secondary weapons systems, thrusters, and various other high-tech instruments of war. Each player draws cards and places them onto the table as fast as they can, keeping in mind that playing too many cards might overheat their Mech. This is real-time gameplay, and the round ends when a player snags the FIRE! Button from the center of the table. Once that’s done, players calculate the range and speed of their Mechs, weapons fired, and heat generated to determine the winner. HAWKEN: The Real-Time Card Game will debut with two different packages, both featuring two decks: Scout vs. Grenadier, and Sharpshooter vs. Bruiser. Fans can mix and match the cards in each deck to customize their very own Mech deck. Fans who pick up a copy of HAWKEN: The Real-Time Card Game will also receive a code that can be redeemed on www.playhawken.com. The code is worth 6500 HAWKEN Credits that players can spend on purchases in the HAWKEN video game. HAWKEN: The Real-Time Card Game will be available in early 2014 for a suggested retail price of $15.00. This game comes with two 40-card decks, a heat and range tracking board, and Mech standees to show off your Mech. 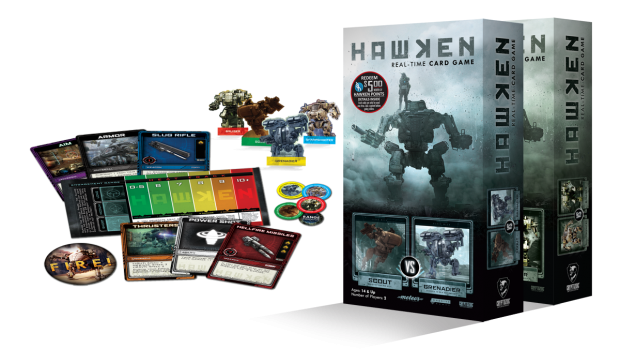 For more information on the HAWKEN Card Game, check out the product page here and watch for more news at www.cryptozoic.com. Stay up-to-date on the latest products, news, and contests by following Cryptozoic Entertainment on Facebook and Twitter. The components included look nice, and to get what is essentially $5 worth of points for the HAWKEN PC game, that’s like getting two decks for $10 or all four for $20. While I haven’t been sold on most real-time games, I think that this might work well with the subject matter.